Five years after prime minister David Cameron stunned new-age computer policy wonks with his election pledge to publish all government contracts “in full”, it looks like the only thing he issued in full was hot air. Because a lot of contracts weren’t there on the Contracts Finder website he launched for the purpose in 2011. And when they were, they were not “in full”. 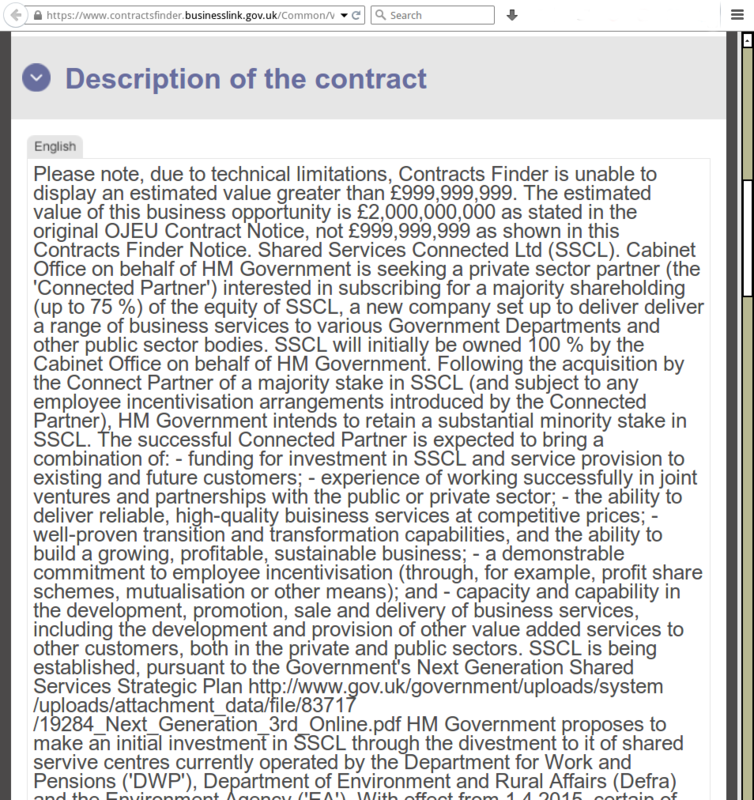 It was so hard to find Contracts on Cameron’s Contracts Finder that he really ought to have given it a different name. When it takes all day to find a contract then to learn it’s been stripped of meaningful information, you have to wonder what the point was of putting it there in the first place. It became apparent after repeated bad experiences with Contracts Finder after 2011 that some definitive explanation must be found. Because Cameron’s contract pledge was one of the most charming things about his 2010 manifesto for government. It was so radical, so progressive, you couldn’t quite believe it was true. When subsequently it was never possible to find government contracts for some major project in the news, and government departments ignored direct requests for them, it seemed like the policy had been ditched. Contracts Finder had pinched much information it did have from the European Commission procurement portal, Tenders Electronic Daily (TED). TED has published detailed data about UK tenders and contract awards since 1998. Contracts Finder appeared to get its information about UK contracts by ‘scraping’ it off TED. That’s web parlance for copying information from someone else’s website with an automated software tool. It republished the TED data as its own. But it did so dodgily. TED stored its contract summaries in 30 data fields and displayed them in a way you could read. Contracts Finder bunged them up often without formatting. So the coalition government had fulfilled its open contracts pledge for Cameron’s Euro-septic, thumb-print electorate by replicating the EU tenders portal but badly. The EU already did it well. The Best of British was a bodge. If you wanted to find contract information on Contracts Finder you were even better off looking for it on TED first, because TED’s search facility was sophisticated and reliable after nearly 20 years of live running. You could search TED by any one of those 30 data fields. It looked a bit old-fashioned and its operation was a little arcane. But it worked. Cameron’s proposed something much more. Not just contract summaries but actual contracts. He didn’t deliver because there’s no law that says public bodies have to publish their public contracts on Contracts Finder. He just issued a policy that said they ought to. So some of them did. Some didn’t. TED delivered because EU law insisted public bodies publish summary information about their business deals. If they don’t, “the contract can be torn up,” said Richard Auton, director of law firm Walker Morris. “At the EU level its very strong. So by and large, people follow it to the letter,” he said. Cameron had a chance to give his open contracts pledge muscles like TED’s. But he passed it up. EU countries including the UK got started reforming their common procurement rules right after he came to power. The UK got stuck right in. We know this because Francis Maude, minister in charge of Cameron’s transparency policy, made such a fuss about it. We’re fighting in Brussels to make EU procurement reforms reflect our policy goals, he told suppliers. That’s us, the beefy bulldogs sorting those feckless continentals out with our no-nonsense can-do. But when the EU published its Public Contracts Directive last year, it didn’t decree that contracts would be published, said Abby Semple, a consultant on European procurement law. It said only that public bodies should publish procurement documents. And that was only for the sake of competition. Cameron’s big transparency ticket had been accountability for small people and competition for the small companies they ran. Never mind though, because Cameron had another chance to make his open contracts pledge stick when it came to implementing the EU directive in UK law. But he passed that one up as well. The old EU rules just made companies publish summary notices of their business deals, remember. This always applied only to deals above about £110,000. It was that way for twenty years. Cameron produced his British rules in February: the Public Contracts Regulations 2015. They decreed that public bodies would have to publish summary information about their small business deals as well. That was all. Just summaries for a few more deals than before. Now with the new EU law telling public bodies to publish procurement documents for big deals, and Cameron’s law that they must publish summaries of small deals, the future is looking a little less useless for Contracts Finder. The EU law doesn’t want the documents on TED. It wants only a link to them. Cameron’s law cites Contracts Finder in person. Cabinet Office even released a beta prototype of Contracts Finder 2 in February. It might even be easy to find contract summaries on it one day. But the future’s looking less substantial for Cameron’s open contracts pledge. Though his government published some contracts, its resolve to fulfill this single most remarkable pledge was weak. What will give it momentum after his government has dissolved in two months?